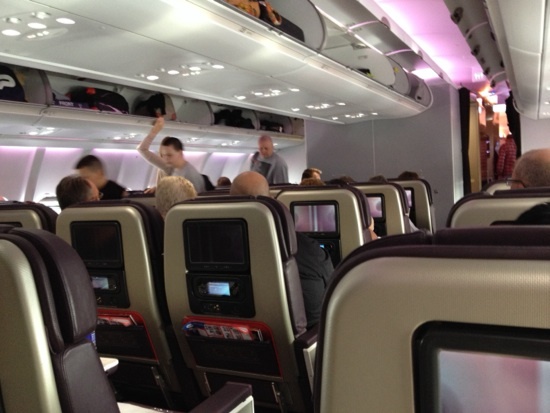 Travel day, we flew to Orlando on Virgin VS75 (airbus) from Manchester. This time it is just DW Tracy and myself and we are doing a bit of a Busman's holiday, enjoying ourselves whilst also doing research etc for the DIBB Guidebook. We thought we would try Premium Economy this time to see if it was worth the extra. PE has now spoilt us and it will now be hard to go back to normal economy when flying with Virgin. For us it was definitely worth the extra, not just because of the larger seats and extra leg room but all the little things that add up too. For example, being in the first group to board, being seated comfortably with a glass of bubbly as everyone else is queuing in the aisle waiting for people to get seated, not having to fight for overhead luggage space, being the first group off the aircraft and the whole general experience. I had booked seats 25H and 25K, these are the back two PE seats with a bulkhead behind. These seats are great as you have no one behind you to knock your seat when they move around. Also you dont get the poking and banging from someone playing games etc on their touch screen. I like the new seat back entertainment but i dont think they put much thought into how someone behind you banging on their screen affect the person in front. Being the first group off the aircraft when we got to the immigration hall it was virtually empty and we were through in 5 minutes. Our luggage was already on the conveyor belt so no waiting their either. The only slight hitch was with the car hire, i had booked Alamo and used the save time, even though it said go straight to the Garage, when i did this the guy in the garage said i needed to use the kiosk so went back across the road to use kiosk but the kiosk didnt want to recognise my driver number. There was no queue at the desks so went there instead and they quickly sorted it. No hard sell of anything either. Once the car was sorted we made our way to Disney's Coronado Springs Resort. New Photo Added by Stu - 4 Oct 13 10:44 AM. SPF50 at the ready - Gingers are coming! I'm praying on the way back we don't get a tappidy tap tapper. 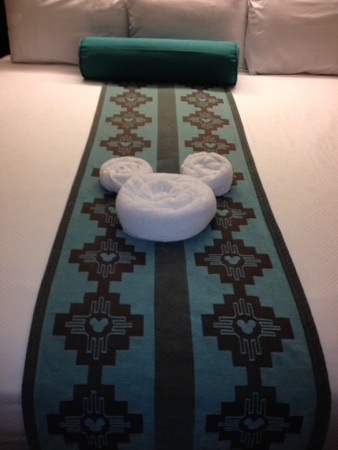 Great start, and what a cute towel arrangement. I so know what you mean about PE, it would take only a bargain for us to consider virgin economy again.